Niang Chin first decided to attend the Retracing Our Roots retreat to meet new people. 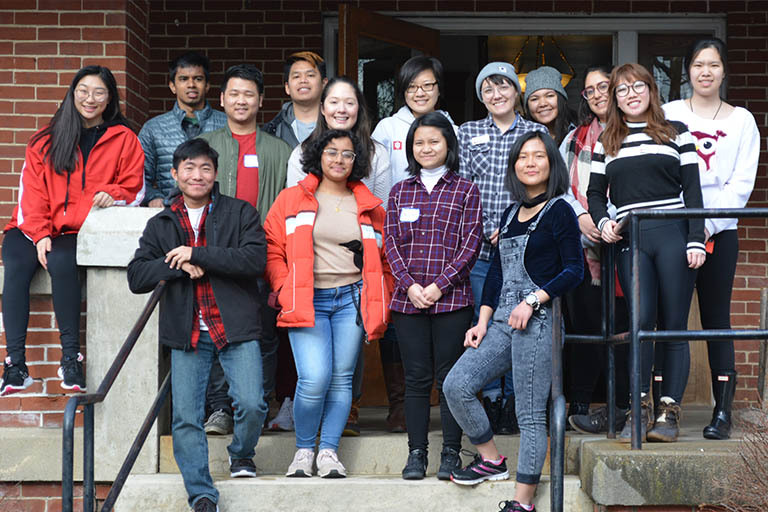 A freshman originally from Myanmar studying microbiology, Chin looked forward to the weekend-long retreat to meet other students and learn about Asian American and Pacific Islander (AAPI) communities beyond her own. What she found during the retreat, however, surprised her. “Surprisingly, I found out that, even though we were from different Asian groups, we had really similar experiences in prejudices we faced,” Chin said. Chin’s experience was just one of the roughly two dozen students who attended this year’s Retracing Our Roots retreat. Hosted by IU Bloomington’s Asian Culture Center and supported by the Office of the Vice President for Diversity, Equity, and Multicultural Affairs, the two-day retreat at the Bradford Woods Manor House gave students the chance to make new friends, examine their identities and learn about their shared histories as members of the AAPI community. Throughout the weekend, staff and facilitators placed an emphasis on building community through fostering new friendships. Between activities like making s’mores, sharing meals together, and participating in group icebreakers, students were able to meet other AAPI students from across the IU Bloomington campus. According to Keiko McCullough, graduate assistant at the Asian Culture Center, such activities are critical in helping students develop a network of friends to accompany them through their time at IU. At the same time, students also participated in facilitated group activities that helped them deeply engage with their own identities and the historical events that impacted them. Led by Lisa Doi, president of the Chicago Chapter of the Japanese American Citizen’s League, students examined their own family histories and compared the ways that past and present U.S. policies had affected them. Students also had the opportunity to discuss instances of prejudice they had encountered, allowing the group to discuss what it means to be a member of the AAPI community in the United States today. “Most people haven’t learned about AAPI history in the American public education system, so this may be their first exposure to AAPI historical events, which may or may not have shaped their own families’ experience or migration history,” McCullough said. Chithra Vedantam, a sophomore from Fishers, Ind., studying linguistics and French, found the retreat’s blend of relationship-building, exploration of identity, and historical education particularly impactful. “It drove home for me that we all have different experiences, but that we are all welcome in this community,” Vedantam said. Visit the Asian Culture Center’s website to learn more about the retreat, the Asian Culture Center, and the events taking place throughout IU’s celebration of Asian American and Pacific Islander Heritage Month in April.